Pop-Up Camper covers help protect your camper from harmful elements when it's not in use, at a fraction of the price of storage. 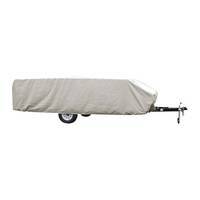 We stock Pop-Up Camper and Folding Trailer covers by ADCO, Classic and Carver, many available to ship the same day! Choose from quality all-weather fabrics like PermaPRO, SFS AquaShed, and Performance Polyguard. 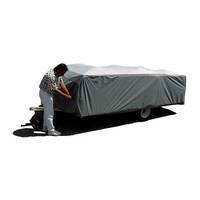 Get the best price on a guaranteed fit Pop-Up Camper Cover at RV Covers Direct. When measuring your camper for a cover, measure the overall length including everything you want protected. Going by RV manufacturers specs can often result in choosing a cover which is not long enough, as the manufacturers do not always include bumpers, etc. 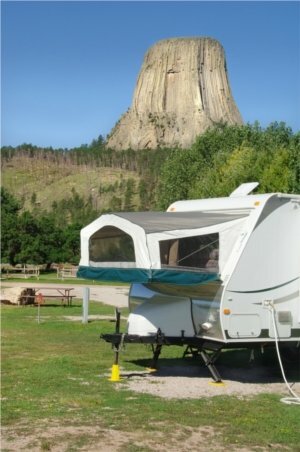 Learn more about our other travel trailer options and accessories. ADCO is the oldest protective cover company in America. Located in Valencia, California, ADCO makes products that are strong, durable, but still economical. For proper fit on an ADCO cover, include bumpers, ladder, and spare tire when measuring. Shop ADCO SFS Aquashed by selecting your RV's dimensions. Join seams are folded four-ply, ensuring neat and clean edges. Shop Carver polyester by selecting your Pop-Up Folding Trailers dimensions, or search by by make, model, and year. Carver Industries has been in business for over 30 years building quality, USA Made boat covers and Bimini tops for millions of boaters. 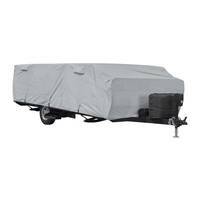 Carver has designed an RV cover for extended outdoor use, using many of the tried and tested quality features that go into each boat and bimini product. Each Carver RV product is made in Landrum, SC by skilled Americans, with attention to detail and quality the driving force behind every stitch. Since 1983, Classic Accessories has expanded their cover business from automobile accessory items to RV covers and more. Classic takes pride in their focus on the customer’s need in quickly and easily protecting your most prized possessions, with a light-weight and durable marine grade cover. How well will your cover fit my pop-up? We do guarantee the fit of our covers. If you aren’t satisfied, contact us within 30 days of receipt, and we’ll make it right. To ensure a snug fit and keep the cover secure, Carver covers use elasticized front and rear hems and heavy-duty hold down straps. Classic builds their covers with elastic corners and integrated strap/buckle system for a contoured fit. ADCO covers have a front and rear cinching system to remove slack as well as attached nylon straps and plastic buckles to hold the cover in place. RV Covers Direct® ships covers from South Carolina Monday through Friday. Since most pop-up covers are in stock, these covers will ship the same day that you place your order. If your cover is not in stock, it will take 5 business days or less to make. Non stock Carver covers will ship directly to you from their factory in Landrum, SC. Non stock Classic covers will ship from Kent, WA. Non stock ADCO covers ship from Valencia, CA. RV Covers Direct® uses FedEx for shipping, with times in transit ranging from 1-5 business days depending on your location. Should I choose Carver or ADCO? Carver covers are warrantied for 5 years and are made from an 8 oz. strong and durable, mildew resistant Polyester. These water repellent covers are built to last in any climate and designed to withstand enviromental assualts, including harsh desert climates. ADCO covers are a more economical alternative. ADCO SFS Aquashed covers, made with polypropylene side panels and a triple layer SFS Aquashed top panel, repel water and are mildew resistant. The Classic Accessory cover option is a perfect intermediate cover between Carver and ADCO. It's extremely light-weight, moderately priced, and carries a Limited Lifetime Warranty. How do I measure my Pop-Up for your cover? Our Carver cover will fit units up to 90” wide. Measure the box length only (including the bumpers, ladder, and spare tire, not including the hitch), in the best imaginary straight line that you can. It’s that simple! Now, simply pick the size closest to your measurement. For ADCO, make sure to include the bumpers, ladder, and spare tire when measuring your RV. Our covers, ADCO, or Carver, will accommodate roof-top accessories including the air conditioner. The Classic cover requires a measurement from outside edge to outside edge of the unit, not including the tongue, and the height from the tallest point down to the ground. This cover allows for a standard 88" width and 42" height. Are your Pop Up Covers breathable? All of our materials are breathable. This means that if any moisture or heat makes its way under the cover, it will be able to evaporate back out. Breathability is very important with RV covers. Non breathable or waterproof covers can trap moisture and cause damage to your unit. You should never cover your RV with a cover that is not breathable.